Australian Eco Shop is a family owned and operated business servicing the local Maitland, Newcastle and Lake Macquarie areas, providing our customers with quality products for a sustainable future. With over ten years experience we are a trusted name in the industry and now operate as a mobile service to provide in-home presentations and quotations. We pride ourselves on only distributing products of the highest quality and efficiency, and ensuring our clients have a memorable customer service experience. When you deal with Australian Eco Shop, you are dealing with a family. 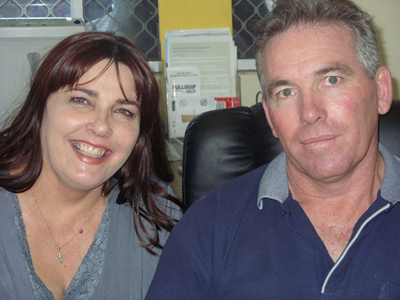 Each with over 30 years experience, Joe and Cheryl will guide you through the entire process, from providing information on our variety of products, designing you an individual quotation, organising delivery and/or installation and following up with genuine after sale service and care. Australian Eco Shop has built a network of trusted and respected, environmentally conscious experts who are licensed and qualified as electricians, 'green' plumbers, bamboo flooring installers and general tradesmen. Australian Eco Shop was built on the belief in a commitment to sustainable living: conserving the Earth’s natural resources for our future generations. We believe that making environmentally responsible choices has a ripple effect in the community which is reflected in our mission statement: "One small drop can build a river of change...".